Description: This large burrowing sea anemone is similar to Cerianthus lloydii but much larger. The length of the column and span of the tentacles is up to 300mm and the column is much stouter than in the common Cerianthus lloydii. The colour of the inner tentacles is pale buff or chestnut, marginal tentacles whitish with fine brown bands, or plain white. There are up to 200 very long marginal tentacles. 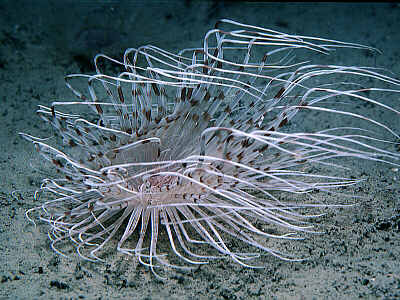 Habitat: Lives in a long thick tube, often 1m long, in mud or muddy sand, from 10m to over 100m depth. Distribution: Recorded in Britain and Ireland from Kenmare River and Kilkieran Bay (western Ireland) and from sea-lochs on the western coast of Scotland. Elsewhere from Scandinavia. Similar Species: A similar large cerianthid anemone whose scientific name is uncertain (referred to here as 'Dorothy'), lives amongst rocks in the Channel Islands and Brittany. Tentacles in two series; marginal tentacles up to 200 in number. Tentacles cannot be retracted into column, but may coil spirally on disturbance. Lives free within a long, buried tube in soft mud. Picton, B.E. & Morrow, C.C. (2016). Pachycerianthus multiplicatus Carlgren, 1912. [In] Encyclopedia of Marine Life of Britain and Ireland.